A. Allow the Agile development teams the flexibility they need, but struggle to keep them connected to your strategic goals. B. Impose an Agile-killing bureaucracy to ensure alignment. 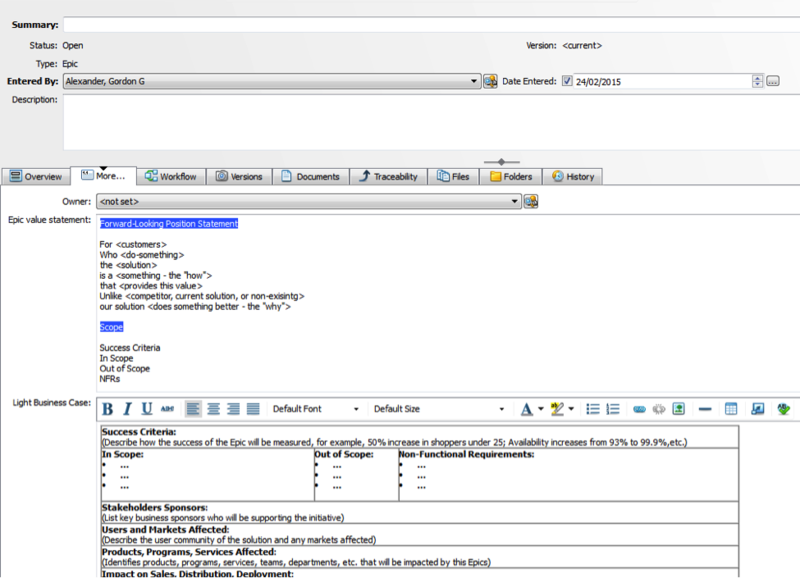 TestTrack gives you the best of both worlds because of the way it allows you to create documents. When you create a document in TestTrack, each item in the document is also a record in the database. 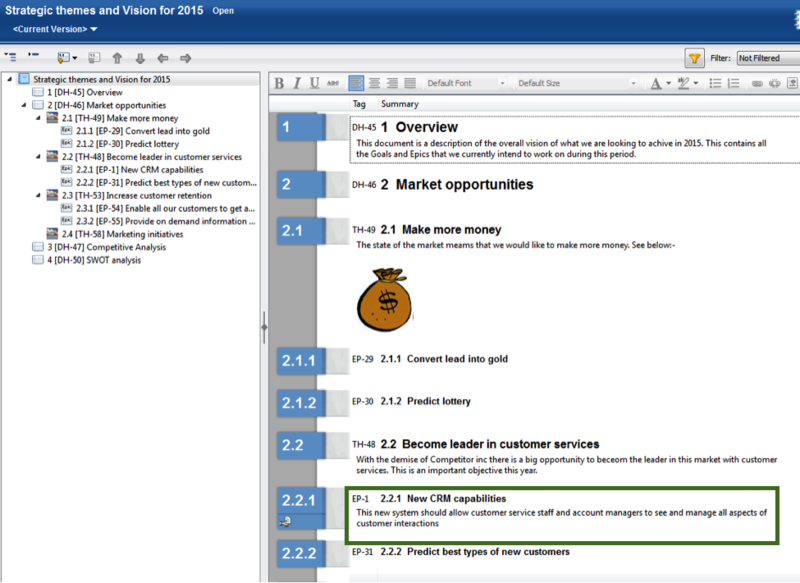 This means that once you create your vision and roadmap documents and finish your high-level assessment and approval, the items within these documents simply and naturally evolve into features, user stories, and—ultimately—working software. 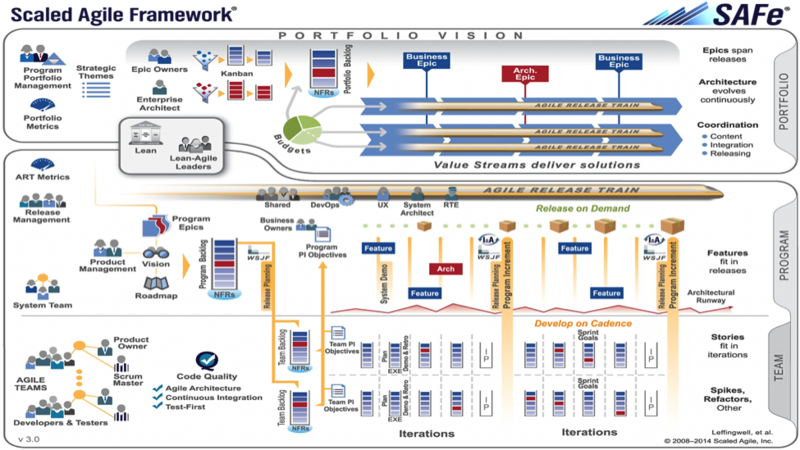 The Scaled Agile Framework® (SAFe®) has some very good ideas around scaling Agile. I've taken their ideas as a framework to illustrate how to use TestTrack to scale and integrate Agile into your enterprise. The basic idea is that, because you have a completely connected end-to-end process in one tool, it is easy to get visibility and transparency. Throughout this series, I'll be referring to the sample project pictured below. [caption id="attachment_17557" align="aligncenter" width="975"] Sample SAFe project in TestTrack[/caption] Before we go any further, I should say that this blog does assume some familiarity with SAFe. I don’t intend to (nor am I qualified to) explain the intricacies of this model. They explain it much better than I ever could here: http://www.scaledagileframework.com/. However, I am going to try and give just enough background about SAFe so that we are all on the same page. 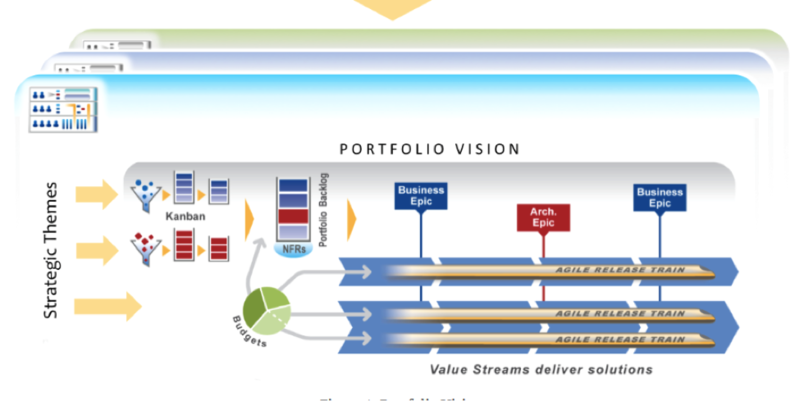 Here is how the good people at Scaled Agile Inc. visualize the Scaled Agile Enterprise: [caption id="attachment_17549" align="aligncenter" width="975"] The Scaled Agile Framework (CREDIT: ScaledAgileFramework.com)[/caption] I’m going to use their terminology and some of their processes to illustrate how you can use TestTrack to assist you as you move towards Scaled Agile. The SAFe model uses “epics” to mean the highest-level item to define what the software is going to do. 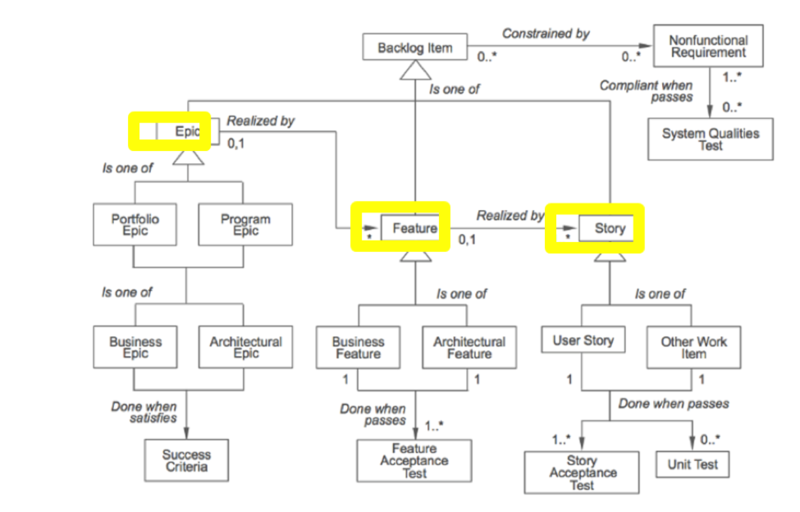 A “feature” is the next level down, with each feature then broken down into one or more “stories.” See the diagram below, which shows the complete model. [caption id="attachment_17551" align="aligncenter" width="975"] The complete SAFe model[/caption] There are three main parts or stages defined in SAFe: Portfolio, Program, and Team. I’m going to walk you through how epics, features and user stories are used in these three stages. I am going to give you an overview of the process, but even so, this is a very large topic. I’ll cover Portfolio today, and the other two stages in future blog posts. 1. Create a folder in TestTrack to contain your epics. 2. Create your Kanban (task board) as shown below. [caption id="attachment_17571" align="aligncenter" width="975"] A Kanban task board in TestTrack[/caption] I would also recommend that you add an automation rule to automatically add each epic to this folder as soon as it is created. If you do that, then all your epics are immediately visible on your Kanban board as soon as you create them and appear in the first column, which is the “Funnel” column in SAFe. Note that you don’t need to do any additional grouping of your epics into themes. 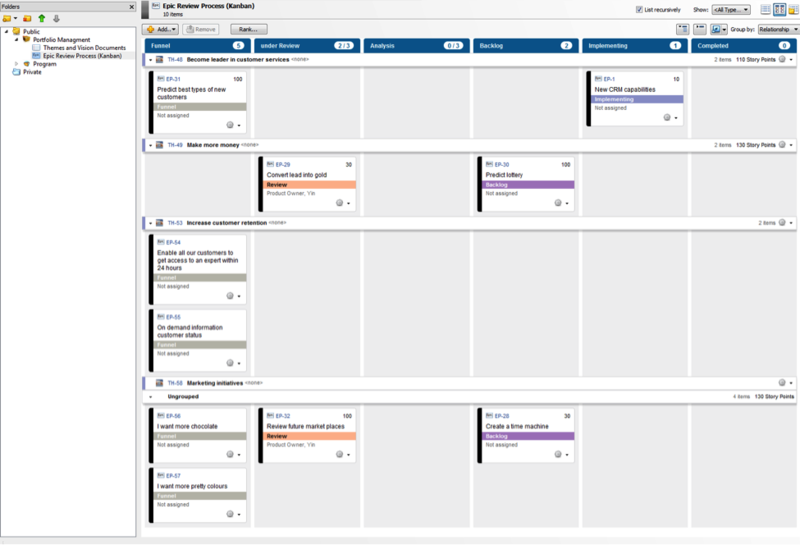 Epics are automatically grouped by theme in your Kanban (if you want them to be), simply because of the way you have organized your Vision document. 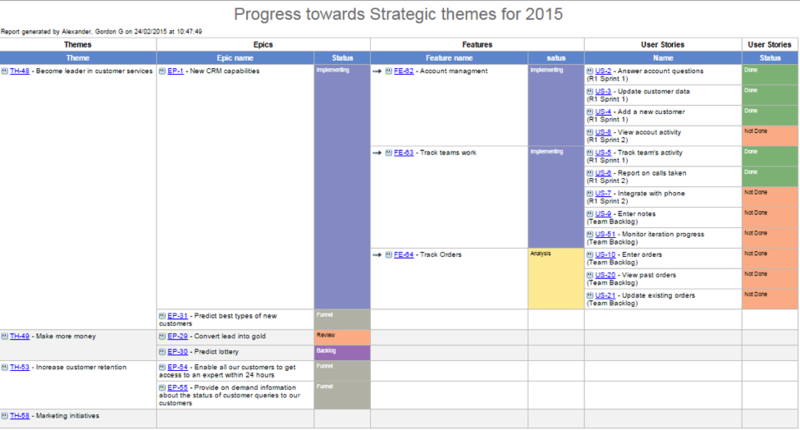 The Kanban board is used to manage the flow of epics throughout their lifespan. Once they reach backlog, they are then ready for inclusion in the Program stage, where we use these Epic records are used as the main input. I’ll look at the Program stage in Part 2 of this series.